1) The cable itself materials, deployment and wave propagation analysis. 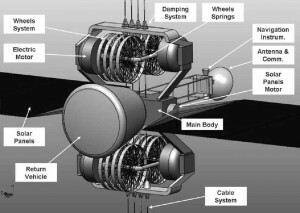 2) Cable car riding on the cable design and analysis. 3) A return vehicle released from the cable design and re entry estimations. 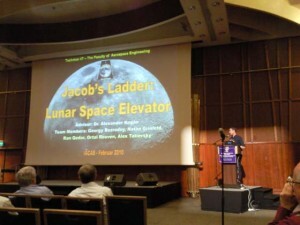 All of these sub systems were combined to the idea we called Jacob s Ladder in order to provide a cheaper alternative to the currently used rocket based ways of transportation between the Earth and the Moon, thus allowing to import large amounts of He3 that can be used as a good source of energy to the planet. Tether Placement: By mothership assymptotic trajectory to L1, cable deployment to Moon surface and anchoring the cable.